Just because everyone knows about your party, doesn't mean you still can't have a few surprises up your sleeve. After all, there is a reason why you seem to always be the one asked to take charge of planning the next party. With this in mind, do you find yourself running out of ideas to keep the fun and surprises going? You can only arrange for so many cool cakes, amazing pizzas, even the odd singing telegram or two. So this time, why not surprise everyone coming through the door with a healthy supply of our black and gold confetti cannons. For those of you who are Pittsburgh Steelers fans or are married to one, why not throw a football party and invite a few of your best friends over. If you really want to make the party more fun, give your guests a party confetti cannon loaded with black and gold confetti. Every time the Steelers score a touchdown, everyone can grab a confetti cannon, run outside and celebrate by showering the yard with metallic black and yellow confetti. Our black and gold confetti cannons are not just for Steelers fans, in fact, they can be used for just about any type of celebration. With spring just around the corner, it's graduation time, both high school and college. As a devoted and loving parent, you are planning to give your grad a celebration party to remember. Graduation parties seem to be all the same these days, cake, beverages, people hanging around chatting. Why not add a little fun and excitement to the party by making sure everyone has a party confetti cannon filled with black and gold metallic confetti? In fact, why not put out a big bowl of confetti cannons for everyone to dig into. At a signal, everyone can give the new grad a shower of black and gold confetti. What a great way to let your grad know just how proud you are of them and to send them off to face the real world in style. Whatever the reason for your next party or even if you don't really have a reason, confetti cannons such as those offered by Wedding Sparklers Outlet are guaranteed to add a lot of fun and excitement. Each party confetti cannon is 12 inches long and 2 inches in diameter. To use, simply twist the bottom of the tube and "BOOM!" out comes a shower of gold and black metallic confetti. The good news about our confetti cannons, is they use compressed air instead of pyrotechnics to expel the confetti. This way you don't have to worry about heat or smoke. This makes our confetti cannons safe for use indoors or outside. 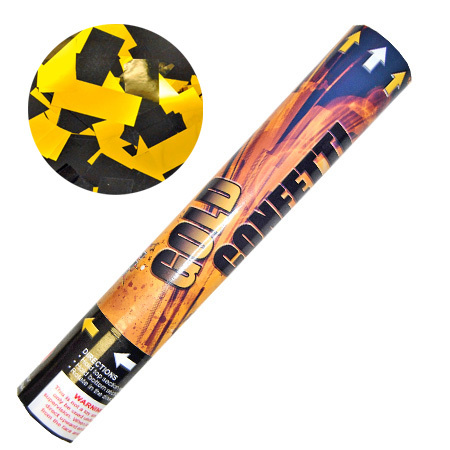 Come visit us at Wedding Sparklers Outlet, and take a look at our black and gold confetti cannons along with our entire selection of party confetti cannons, wedding sparklers, and custom tags. We sell in bulk to help keep our prices affordable.